KANSAS CITY, Mo. — On Monday morning, several City Year members gathered to prepare for their annual Day of Service to honor the late Rev. 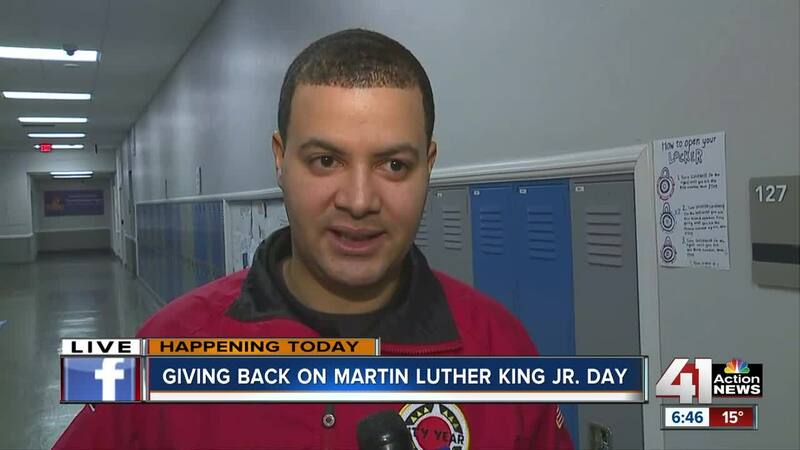 Dr. Martin Luther King Jr.
Jeffrey Shafer, development director for City Year, said the organization commemorates the civil rights movement and honors King's life and work. City Year is an education-focused nonprofit organization that places mentors and tutors in area schools to keep students on track to graduate. The organization serves 29 cities across the country with 58 members serving six schools in the Kansas City area. "I hope that they feel empowered. I hope that they see the work that's been done and understand that the city is rooting for them," Shafer said. This is the third year that City Year has celebrated King's birthday as a "day on, not a day off" through service projects. Years prior they served Northeast High School and Central Academy of Excellence. This year, City Year hosted an event at Northeast Middle School. More than 300 volunteers signed up for beautification projects throughout the school, including painting 55 murals of iconic people and quotes in history. "It brightens up our school and our spirit," said Princess Menyon, an eighth-grader at Northeast Middle School.